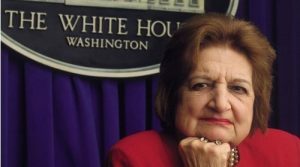 Helen Thomas passed away in July 2013, a month before her 93rd birthday. The following interview was conducted in 2006. “I was just part of a cabal, fighting the injustice of it all, of how women were treated in every field.” Helen Thomas reacts almost hesitantly to the notion that without her, women journalists might not be where we are today. She dismisses being a trailblazer, even though she is the tenacious award-winning grande dame of U.S. journalism, the dean of the White House Press corps. With wit, timeless candor and a razor-sharp voice and pen she has held an unprecedented nine presidential administrations accountable since beginning her career as a United Press International reporter in 1943. Thomas was the first woman officer of the National Press Club after it opened its doors to women members, and for many women she has become a role model and then some. In 2002, she won the New York Women in Communication’s (NYWICI) MATRIX Award for her achievements in the field of newspaper journalism. “I am not a woman. I’m a reporter,” Thomas remarked to NYWICI members during the organization’s 75th anniversary celebration in 2004. “You don’t delineate someone in the profession as to whether they’re a man or a woman, but what they do.” But when she embarked on her career, female reporters were the exception, and a woman reporter covering the White House was unheard of. Is there a stronger competition among women who have had and still have to compete over the smaller share of the pie? Thomas doesn’t think so. “Not anymore.” Were women more reluctant to help each other when you started your career? “No, no, no,” she says with emphasis. And if you could start all over again, would you choose the same profession? “Absolutely. Without a doubt.” The answer comes without delay, and I can hear her smile. Thomas holds many women reporters and correspondents in high esteem. In her latest book Watchdogs of Democracy? The Waning Washington Press Corps And How It Has Failed the Public, published by Scribner in June 2006, she also reminisces about past trailblazers like Dorothy Thompson, Martha Gellhorn, Pauline Frederick, Marguerite Higgins, Doris Fleeson and May Craig. But she won’t single out her own role models or mentors. If anyone, she says, it were her parents—who were illiterate, raised nine children and wanted everyone to be educated—who made the real contribution to her life. 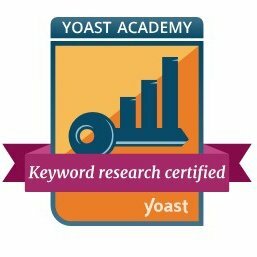 A recent report by the International Federation of Journalists claims that “insecurity in employment and a lower rate of pay appears to be having a negative impact on the quality of editorial content and may be jeopardizing the media’s role as a watchdog for society.” Media realities are changing. “I think it’s terrible if that’s the trend,” Thomas declares. “Nothing can replace experience and real dedication to truth! Young people often don’t react enough to what’s going on in the world. “You got to have a conscience. I’d rather have my nose against the window pane than be part of the crowd. 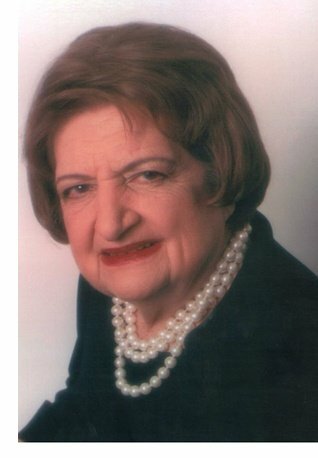 Helen Thomas has always been a role model to me. When I’ve met her and interviewed her, I was struck by her graciousness, her unpretentiousness, her anti-diva-like demeanor, which is hard to find in journalists and people in the media-limelight (women and men alike). She was an outspoken advocate, and mostly, I agreed with her views. However, I did distance myself from her views on Israel. in June 2010, she suggested Israel “should get the hell out of Palestine and go back to Germany, Poland or America.” Thomas resigned over these remarks. I was sorry to see her go. But someone of her stature should have anticipated the damage her distasteful, insensitive remarks would inflict. She of all journalists should have known better not to bring her personal views to her reporter’s seat in the front row of the White House Press Room. But the fact that she resigned after the incident implied that she did, and I admire and respect her for that.